With miles of pristine beach and scenic coastline at your disposal when you stay at The Break, Narragansett is the perfect place to explore by bike, boat, or board. Make your next getaway an active one while taking in all the natural beauty of this charming locale (fun fact, Narragansett was named one of America’s happiest seaside towns by Coastal Living magazine). If you don’t want to bring your own wheels, you can rent a retro chic beach cruiser and helmet from nearby Gansett Rides at 145 Boon Street. From there, point your handlebars towards the William C. O’Neil Bike Path (known around town as the South County Bike Path). This seven mile paved greenway runs along an inactive Narragansett Pier Railroad line, passing through the villages of Peace Dale, Wakefield, and Narragansett before ending near Narragansett Town Beach. There are plans to extend the trail all the way to the beach but at present, cyclists will need to use an on-road route to reach the shore. If you want to make the most of your rental, you can also take your bike on the 55-minute Block Island Ferry from Point Judith and spend the day exploring this picturesque island. The waters off Narragansett are prime for fishing enthusiasts. There are many fishing charter outfits in town, and who knows? Today might be your lucky day to reel in The Big One. The Seven B’s 80-foot yacht makes several trips out of the Port of Galilee each day in search of cod, fluke, striped bass, squid, and sea bass. Their crew is top notch – they’ll keep your catch on ice and assist with any tackle needs – and we’re especially partial to the breakfast and lunch served in their heated galley. Perhaps your idea of a relaxing day on the water is more scenic than strenuous? Then you’ll enjoy a narrated cruise around the Newport Harbor and Narragansett Bay aboard a classically restored 50-foot lobster boat with Gansett Cruises. You’ll glide through Newport Harbor and Narragansett Bay’s East Passage in style on this 90-minute tour. As an added treat, every cruise offers a complimentary taste of the Ocean State, from Del’s Lemonade to Coffee Cabinets and Clam Quahog “Stuffies,” in addition to their cash bar. Given Narragansett’s claim to fame as the New England capital of the longboard, you didn’t really think we would end this without mentioning surfing, did you? It’s no coincidence that our hotel’s name calls to mind the many enviable surf breaks found just beyond our doors, and we highly recommend that you try to hang ten at least once while you’re here. Bring your own quiver (and wetsuit, depending on the season) or rent a board through Narragansett Surf & Skate, owned and operated by local son and surfing legend Peter Pan. Peter himself often gives lessons, and discounts are available to guests at The Break – lucky you! Shoot us an email ahead of your visit or ask at the front desk for details. 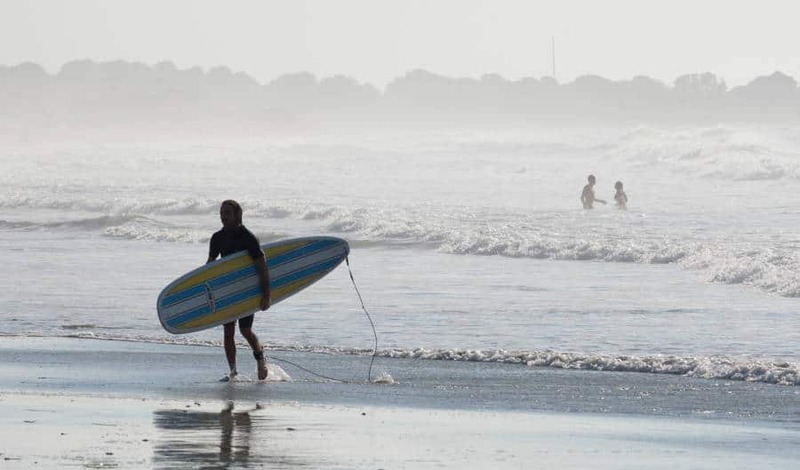 Narragansett Beach offers consistent swells that can be surfed year-round, and not surprisingly, the water gets a little crowded in the high season.